Ryan Cunningham and surprise birthday guest of honor Krista Johnson. Be sure to check out all 114 of our photographs from this event HERE! SOUTHWEST -- Londoners might have been feting Queen Elizabeth II's 60 years on the English throne over the weekend, but the District played host to its own special jubilee celebration on Saturday night, as Georgetown Ella-Rue boutique owner Krista Johnson was surprised by friends and family with a blowout 30th birthday celebration aboard the U.S.S. Sequoia Presidential Yacht. 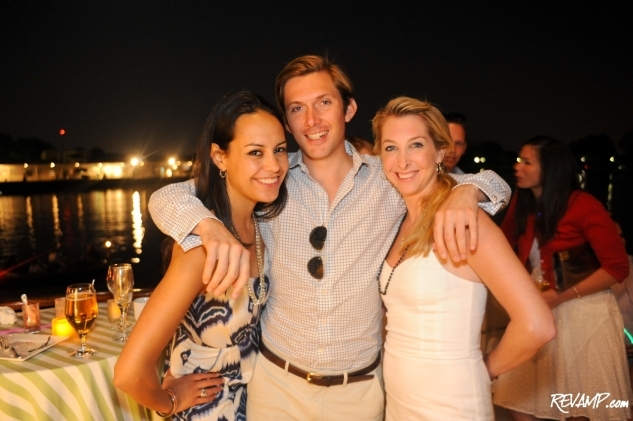 Organized by Johnson�s longtime boyfriend, Ryan Cunningham, and a close circle of friends and family, the party saw approximately 40 young Washingtonians board the 104-foot vessel that the History Channel dubbed �the Rolls-Royce of yachts� just before sunset, for a leisurely evening cruise on the Potomac. The celebratory affair began with a champagne toast aboard the Sequoia�s historic top deck (where President Nixon and Leonid Brezhnev negotiated the first arms control treaty between the U.S. and the Soviet Union), as the joyous guest of honor greeted her surprise guests and the ship castoff from its pier at the Gangplank Marina. A purple �Happy Birthday� hat was quickly hoisted upon Johnson and the stage was set for a beautiful birthday bash! 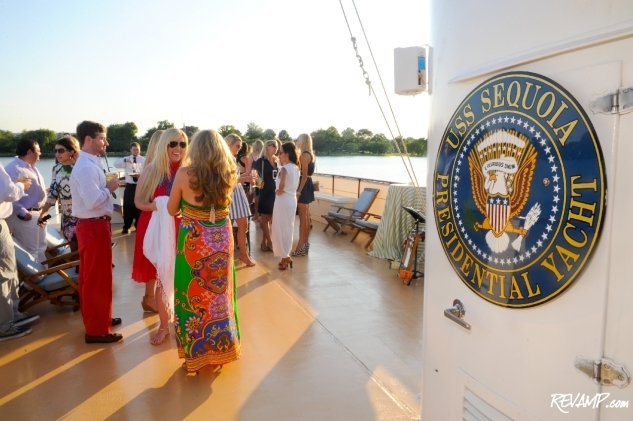 Over the next two hours, with the yacht hugging the banks of the Potomac, revelers were treated to a sumptuous gourmet buffet inside the Sequoia�s main salon (where FDR and Winston Churchill planned D-Day) consisting of everything from crab cakes to beef tenderloin to �swanky� mac �n cheese. The party�s soundtrack came courtesy of swingin� jazz quartet Laissez Foure, with bandleader Ken Matthews setting an appropriately upbeat tone. And with the sun soundly set and D.C.�s sparkling cityscape serving as a backdrop, the surprise celebration was officially pronounced a success as Johnson blew out the candles on her �Bon Voyage to 29� birthday cake. While the party continued long after the Sequoia had returned to its moorings with after dinner libations and dancing (a particularly spirited group dance to Carly Rae Jepsen�s �Call Me Maybe� was performed), it was still difficult for guests to force themselves to leave the scene of such a perfect evening. U.S. royalty for one magical night at least� Happy birthday Krista!